Mauritius' south-western tip is where the famous peninsular island of Le Morne Brabant can be found. It is distinguished by its basaltic monolith scaling up to 556 metres above the sea level and it itself covers an area of 30 acres of the peninsula. The bluish-green lagoon surrounding the peninsula from all directions and the water tempering playfully with the stretches of white sandy beaches clustered with palm trees makes it an attractive tourist location. The beaches are divided into two separate parts. The northern part is devoted for swimmers and those who prefer chilling out in the beach while enjoying the view of the azure waters; the southern part is water sports lovers who are fond of windsurfing and kite surfing. During dry seasons, the peninsula transforms into a relatively arid atmosphere, making it ideal for adventure activities like hiking and trekking along the mountainside. Other than being blessed with its physical beauty, the Le Morne Brabant has a certain ‘dark’ history and has hence been declared as a UNESCO World Heritage Site. The cultural inclination tends to have a belief in a ‘myth or legend’ that dates back to the early 19th century. This peninsular region was a hub for a lot of slaves, who ran away from the jurisdictions of their masters and took refuge here. In 1835, Mauritius witnessed the abolition of slavery, and so, to inform the slave refugees about the news of their liberation, a team of police officials was dispatched to Le Morne to inform the slaves that they were free men and women. However, the lack of communication created a sense of panic and havoc among the refugees once they saw the approaching unknown vessel of uniformed men. Struck by fear of being captured again, hundreds of them jumped off from the monolith and committed suicide. Although, even though there isn’t any physical evidence of this tragic event, and it only carried down over the years through word of mouth; Le Morne has been declared a UNESCO World Heritage Site and several monuments have been created at the base of the monolith as a tribute to the lost innocent lives and accounts as a famous tourist attraction. Another fascinating site that pulls the tourists like a magnet to Le Morne is the underwater fall. As astounding as it may sound, it is nothing but a wondrous illusion of nature. The shores of Le Morne showcase this phenomenal anomaly. The underwater fall is a result of underwater currents, and sand and silt deposits moving along with the flow of water creating the illusion of the fall. This deceptive structure directs the water flow downwards to the bottom of the ocean and makes it seem like an underwater cascade. The visibility of water plays a vital role in the whole process of this aquatic mirage. The different shades of colour – white, blue and green – intermix together in layered patterns illuminating this vibrant optical illusion. Be that as it may, this thing of beauty isn’t visible while standing on the shores and it doesn’t look anything alien. It is only possible to witness this earthly miracle from a bird’s viewpoint. Helicopter rides are provided at a reasonably affordable price of USD 300 to 1500 to fulfil the pleasure of a 360 panoramic view of the underwater falls! Le Morne Brabant is a paradise for hiking and trekking lovers. The mighty Morne Brabant is a mountain with extremely sheer slopes which takes some effort to scale. It is very much possible to cover the slanting grounds and relish some fantastic views of the landscapes of the union of ocean and sand. Trekking on the Morne Brabant involves two distinct phases. At first, the trekkers must follow a steep pathway leading to the half of the mountain. The second half involves reaching the peak using the ropes that are lodged onto the rock walls. For a more athletic experience, the tourists can opt for the trail running about 15 kilometres from the seaside to reach the high grounds of 260 metres above sea level. The total hiking roundtrip distance is 7 kilometres, with a combination of plain and steep surfaces. The maximum scalable altitude is 500 metres. The average time required for a complete hike is 3 to 4 hours. The peninsula has a microclimate and prone to change any moment. Hiking professionals and tour guides must be taken along. Access to the top of the mountain is only permissible under authorised and licensed guides. The guides have full authority and right to change the tour’s status quo depending on the weather. The participants of the hike must be physically and mentally sound and mustn’t be under the influence of any alcoholic drinks or drugs. It is recommended to have a proper meal before hiking. Minimum age requirement is ten years. Participants are requested to wear proper hiking shoes, bring a suitably light backpack with sufficient water supply and the essential things. The individual tour booking prices are INR 1500 per person. The cancellation policy refunds 50% of the total cost if the cancellation is made a day before the hike. 1st of April to 31st of October: Morning hikes begin at 7:00 AM from Monday to Saturday. Afternoon hikes start at 1:00 PM only on Tuesdays and Thursdays. 1st of November to 31st of March: Morning hikes begin at 6:00 AM from Monday to Saturday. Afternoon hikes start at 2:00 PM only on Tuesdays and Thursdays. Le Morne Brabant’s scenic grandeur is a heart of some of the finest hotels and resorts in Mauritius. 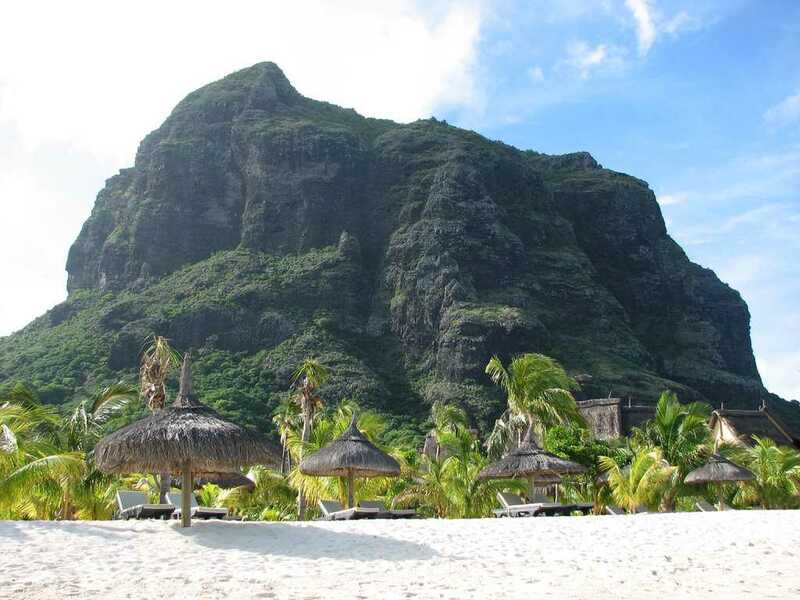 Lux Le Morne is a luxurious hotel located at the foot of Morne Brabant amidst the blue lagoon by the beach. Located between the mountain and the lagoon is another fabulous place full of royal villas and sea view rooms, the Paradis Beachcomber Hotel. Similarly, St. Regis Mauritius is another haven for tourists for an idyllist stay. So, for those who are planning a vacation full of scenic beauties and adventure-packed activities, Le Morne Brabant couldn’t be more perfect to rejuvenate the senses to its core. Be it the colossal monolith Morne Brabant with its historical backdrop or the mindboggling optical illusion of the underwater falls on the shores, the coastal peninsula of Le Morne doesn’t fail to surprise you! You should head towards the Le Morne village and follow the brown signs that read Le Morne UNESCO Heritage Site. It will lead you to the dirt road which takes you to the base of the mountain where you can find a safe parking space at the end of the road.